We’re treated to some huge festival headliners across the globe in 2019. What gear do they use to create their unique and fresh sounds? Some guitarists like to keep their cards close to their chest when it comes to live rigs. Luckily, it’s a bit easier to find out what guitars they play rather than their pedals or amps. We’re going to dive into the sea of festival headliners and discover the incredible, and sometimes surprising, guitars they put to use. The 2019 Brit Awards British group winners are playing the festival scene this year promoting their album A Brief Inquiry into Online Relationships. It packs a fair amount of hooky, overdriven guitar lines as well as crystal clear cleans. Frontman Matt Healy almost exclusively uses a Fender ‘66/’65 Mustang to get the bright, crisp tones that have spanned all of The 1975’s albums. One of his Mustangs is equipped with boutique Mojo hand-wound pickups. Lead guitarist Adam Hann prefers the modern feel of a Music Man John Petrucci signature JP6. It might seem a bit out of place for a pop guitarist to use an instrument made for Dream Theater’s heavier riffs, but it clearly works wonders for their silky smooth sound. 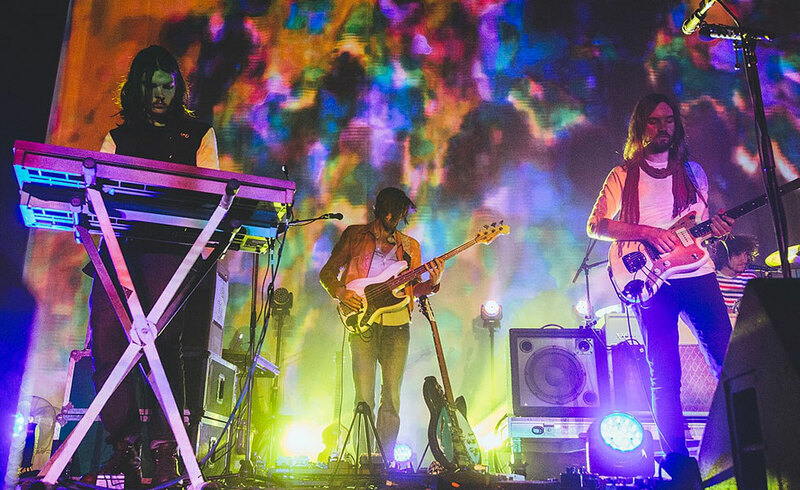 Multi-instrumentalist Tame Impala mastermind Kevin Parker is a vintage Rickenbacker player. He has used the iconic-shaped 335 all over his psychedelic-sounding studio albums and also plays it live. It’s a head-turning beauty with a quick neck and classic toaster style pickups. He says the sixties models just have something over the modern variants. His alternative axe of choice is a modern Fender Strat equipped with a MIDI pickup. This allows him to harness different sounds on stage beyond his standard guitar tone. The guys from Iowa are back on the live scene and you could have a pretty solid guess at the gear they use by now. Jim Root is still rocking his signature Fender Strat, Tele and Jazzmaster shapes equipped with EMG pickups. Co-guitarist Mick Thompson used to wield an Ibanez but moved over to Jackson for his super strat Soloist signature. Featuring a Floyd Rose Original tremolo and Seymour Duncan Blackout humbuckers, this beast was built from the ground up for all-out metal. The rock behemoths are bringing the party vibes to Reading and Leeds in England this year. Their energetic shows are always capped off with top class playing on some stunning guitars. Frontman Dave Grohl is never far from a Pelham blue Gibson DG-335 semi-hollowbody. This has been at the core of the Foo Fighters’ sound since the late nineties. Lead guitarist Chris Shiftlett plays his awesome (and relatively inexpensive) signature Tele fitted with high output humbuckers, but sometimes refers to his Fender Custom Shop or Gibson Custom 1957 gold top. Tool are finally back after years in hiatus. Also headlining at Download as well as Rock Am Ring in Germany, the prog metal outfit relies on Adam Jones for all guitar parts. His extensive use of effects and amp layering simply wouldn’t sound the same without his trusty Gibson Les Paul Custom. This provides a perfect sonic platform for thick chuggy riffs to winding overdriven melodies. Simon Neil is synonymous with the Stratocaster. Whether it’s the old Mexican models, the new Player series, Japanese FSR or unique relic custom shops, the Glaswegian is loyal to Fender. It’s fairly surprising too, considering the immense wall of sound the three-piece throw out. From super heavy riffs (thanks to a Boss Metalzone of all things) to delicate cleans, his Strats sweep up whatever he throws at them. Las Vegas outfit The Killers are back in the UK headlining the most famous music festival in the world. Founding guitarist Dave Keuning took a short hiatus in 2018, but should be ready to line up alongside his bandmates and live guitarist Ted Sablay in 2019 to perform their unique style of poppy, synthy rock. Keuning most notably plays a Gibson Explorer and Ibanez Destroyer. These two similarly shaped designs are becoming less and less popular among modern guitarists, although they certainly still have a swagger about them that fits the post-punk aesthetic of The Killers. He used the Ibanez Destroyer almost exclusively to write and record their debut album, Hot Fuss. Dubbed the ‘Prius of pop’, George Ezra has anything but a boring taste in guitars. He mainly rocks a Gretsch Player in dark cherry, a beautiful sight to behold. This is our first semi-hollow on the list and comes equipped with a classic Bigsby trem, beefy High Sensitive Filter ‘Tron pickups and Schaller locking tuners. His exquisite taste continues into Gibson territory with the ES-225T utilising two P90 pickups and that striking trapeze tailpiece. The Haymaker is one of the most famous guitars in the world. 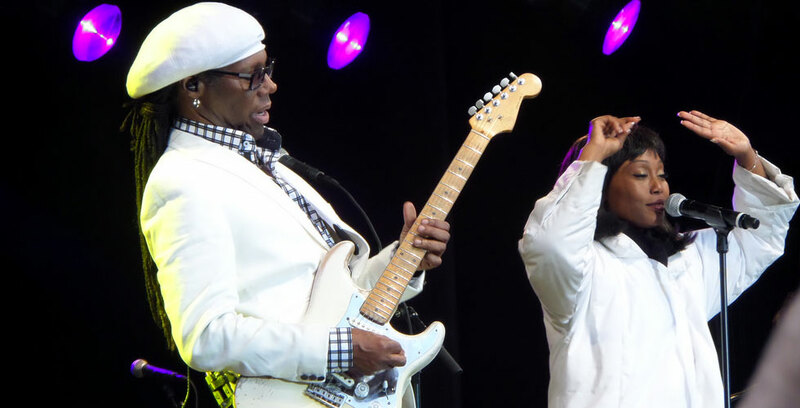 Nile Rodgers bought the white Fender Strat in 1960 on Miami Beach. It has a retro-fitted ’59 neck which is slightly larger than the stock profile. This made it easier for Rodgers to wrap his thumb around the top of the fingerboard and pull off those off-beat rhythms. If you enjoyed this read, check out more of our Industry articles!